Maryland made news recently when a law went into effect that banned the direct sales of cigars, along with other non-cigarette tobacco products in the “other tobacco products” (OTP) category, by out-of-state retailers to the state’s residents. The law, which was introduced at the request of the state comptroller, passed in 2010 but took effect on May 1. Cigars International also accused Maryland lawmakers of trying to protect cigar shops from out-of-state competition. Statements from Maryland officials deny such charges, but do say that banning shipments will help them collect OTP taxes. Still, it’s true that the International Premium Cigar & Pipe Retailers Association (IPCPR) doesn’t oppose such legislation. Chris McCalla, legislative director for the group, says the group is “neutral” on the issue of shipping bans. Apparently, the brick and mortar cigar shops that make up most of the group’s membership were split on the issue in the past. That some store owners think making out-of-state competition illegal would benefit them is no surprise. But the question isn’t if store owners can gain an advantage from interstate shipping bans, it’s whether such bills are good for cigar smokers and the industry. To get prospective, I asked some people in the industry for their thoughts on the issue. Frank Herrera, a Florida lawyer who specializes in cigar trademark law and is the owner of La Caridad de Cobre, sounded hopeful that the Maryland law would be fixed soon. Skip Martin, owner of the Texas-based Hava Cigar Shop and co-creator of Adrians CroMagnon Cigars, had stronger words for cigar shops that think they can gain an advantage by making out-of-state competition illegal. That last point really hits the mark. Government intervention is the biggest challenge facing the cigar industry, with taxes, smoking bans, and FDA regulation all posing serious challenges to cigar shops, cigar makers, and smokers alike. Now, you’ll find no bigger supporter of your local cigar shop than me, but encouraging the government to choose winners and losers in the cigar industry is far too dangerous of a game. When state legislators push for higher tobacco taxes, cigar shops lose the moral high ground in opposing them if the profits they are trying to protect are based in part on laws protecting them from competition. After all, you can’t very well claim you want to be left alone when you’re willing to enlist laws to limit the choices of your customers. He’s right. The cigar industry has enough trouble keeping government off our backs without being divided between online and local retailers. For the sake of cigar smokers and the industry as a whole, bans on shipping cigars that limit consumers’ choices must be opposed. I've read the CI email, a bit about the bill, and the comptroller's response to my my buddy's letter. I've yet to write my own letter to the comptroller and govenor who signed the bill, but I will. The comptroller has been pretty adamant that the bill is NOT intended to help small business. He also makes it clear that this bill was not drawn up with individual cigar enthusiasts in mind. That's what really makes me angry. This bill was a ban, not a raise in taxes. And it's very broad. They passed a bill that they didn't fully understand and did not see the repercussions. That makes them unworthy of their station. As for B&Ms, everyone in the cigar business will benefit if prices are down and product is accessible to new people. They should concentrate on what they can do better than any cateloge or website: offer a comfortable atmosphere, good advice/service/support, the ability to select singles you can actually hold in your hand, etc … We need to support the industry when it seems to be such a trendy political target. It seems like a reasonably good dormant commerce clause claim could be raised to have the law struck. An issue Mr. Loope may want to pursue. i have always said bricks and mortar should somehow join into a co-op so they have the same buying power as the big internet guys. 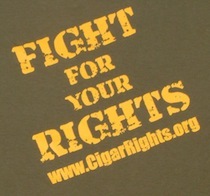 the big internet guys are also the biggest tobacco co. how do you compete against the people you buy from. You're right that small shops are not going to compete with the biggest online retailers on price, but price isn't the only way to compete. After all, if only price mattered no one would drive any cars that cost more than a Kia. My colleague said it best when he said that the government shouldn't be in the business of picking winners and losers in the premium tobacco industry — or any other industrty for that matter. Consumers, as well as innovation and progress, always seem to lose when politicians try to dictate laws like the one passed in Maryland. Here's hoping the law gets shot down quickly and serves as a message for other states. I wrote a letter to the Maryland comptroller, Mr. Franchot, that I intend to continue to order cigars from out-of-state shippers such as J*R and Famous Smoke Shop as in the past. Can I then expect helicopters with flashing lights overhead? Raids on my house by the Maryland State Police? I bet any and every Maryland cigar buyer is not going to stop ordering from the mail order sources. As onerous as this ill-advised legislation is, nothing, I predict, is going to change. I wonder if Maryland governors consider this law democratic, which would be a complete nonsense. They can ban ALL mail and Internet orders as well! What's the difference between tobacco orders and groceries for instance? Would there still be supporters of such dictatorial measures?